In previous games, there was a Trainer Card which showed the details of your journey. This will show the money you have, the Battle Points, the amount you have played, when you started your adventure and so forth. However, while previous Trainer Cards provided various accomplishments to be denoted by colour change and stars, Pokémon Ultra Sun & Ultra Moon continues the shift of having a page at the bottom that showcases various stamps that you can earn throughout Alola. Instead of badges and stars on the trainer card, there are instead various stamps that you gain during completion of the game. These range from completing Island Challenges to completing Pokédexes. 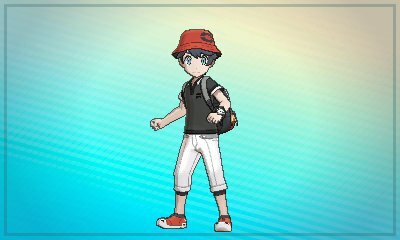 Official Pokémon Trainer You took the first step as a Pokémon Trainer! Melemele Trial Completion With this stamp, all Pokémon up to Lv. 35 will obey your every command. Akala Trial Completion With this stamp, all Pokémon up to Lv. 50 will obey your every command. Ula’ula Trial Completion With this stamp, all Pokémon up to Lv. 65 will obey your every command. Poni Trial Completion With this stamp, all Pokémon up to Lv. 80 will obey your every command. Island Challenge Completion With this stamp, all Pokémon will obey your every command. Melemele Pokédex Completion You registered all Pokémon on Melemele Island! Akala Pokédex Completion You registered all Pokémon on Akala Island! 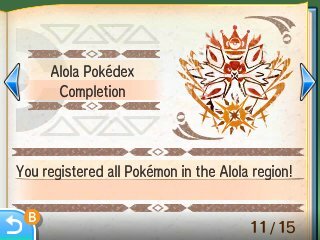 Ula’ula Pokédex Completion You registered all Pokémon on Ula’ula Island! Poni Pokédex Completion You registered all Pokémon on Poni Island! 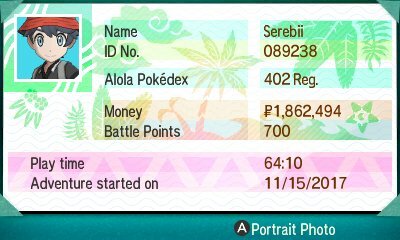 Alola Pokédex Completion You registered all Pokémon in the Alola region! 50 Consecutive Single Battle Wins You achieved 50 consecutive wins in Single Battles at the Battle Tree. 50 Consecutive Double Battle Wins You achieved 50 consecutive wins in Double Battles at the Battle Tree. Poké Finder Pro You obtained the final version of the Poké Finder! 50 Consecutive Multi Battle Wins You achieved 50 consecutive wins in Multi Battles at the Battle Tree. With your Trainer Passport, you get a special passport photo .This photo is retaken every time you update the visual aesthetic of your player but if you don't like the way the photo looks, you can retake the photo within the Trainer Passport option. In the mode, you can rotate and zoom in or out of the character for the photo. This photo will appear whenever you connect with another player, as well as when you load up your game.